Handling dynamic permissions on Android is a major PITA, mainly due to the braindead API design. This library is yet another helper that makes permission handling easier. 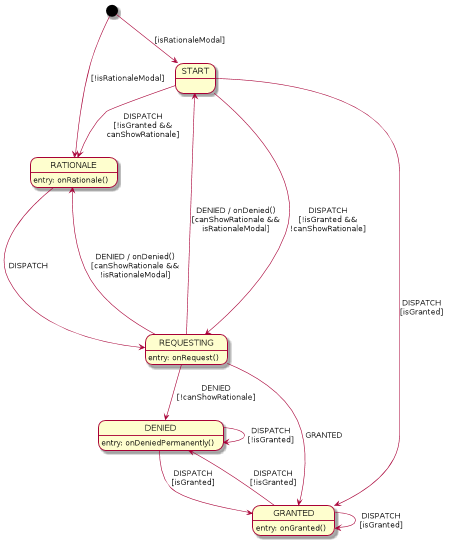 It's based on state machine that handles the user flow. Pass a code that requires a permission as a callback and invoke it via EzPermission.call() helper. The helper will handle permission flow and call intended code when permission is available. This library is focused on permission handling logic and it doesn't contain any UI code. Modeless flow is useful in situations, when we can't construct the screen UI without proper permission. A canonical example of such case is a camera application, where camera preview occupies full screen. Modal flow is probably the most popular one. Permission rationale is shown as a dialog (or similar UI widget), that breaks the user flow. Once user accepts the rationale, we launch permission query again. With EzPermission this is... well... easy. Callbacks provided to EzPermission are being invoked by the state machine at appropriate moment. You should consult provided sample to see how to use those callbacks to implement UI changes (reveal rationale, launch alerts, etc).